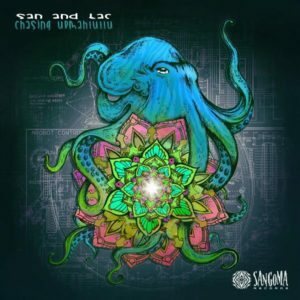 Sangoma Records brings you another release, this time from San and Tac, a production team from the island of New Caledonia in the South Pacific. Tristan Guillaume (San) and his mischievous imaginary monkey friend Tac have teamed up once again to bring you a deep quirky ride here on Chasing Urmahlullu. The style of this release is a fusion of forest music, night-time psychedelia, and a pinch of the Australian progressive vibe, definitely fresh and full of surprises! Mastered by Ryanosaurus. MP3 Download | FLAC Download | WAV Download · Download count: 12,347. The other day i was Chasing Urmahlullu…couldn’t find him…. Great Forest Track!! already had this EP and loved it… happy to see it here! boom! Clear sound with natural progress and mental too! I thinks it is not so far to the free party sound, perhaps a way to explode…. I really like it, always imagine octupus tentacles wobling around when Tentrikular is playing…..